Our star renderer portrays stars in their correct 3D position, relative size, brightness and colour, based on astronomical catalogue files of up to one million stars. Colour comes from each star’s outer atmosphere (the choronosphere), with foreground stars represented as textured discs, with realistic limb-darkening. This enables us to present not only an accurate picture of the night sky as a backdrop to our Earth or planetary sequences, but also to fly between the stars. 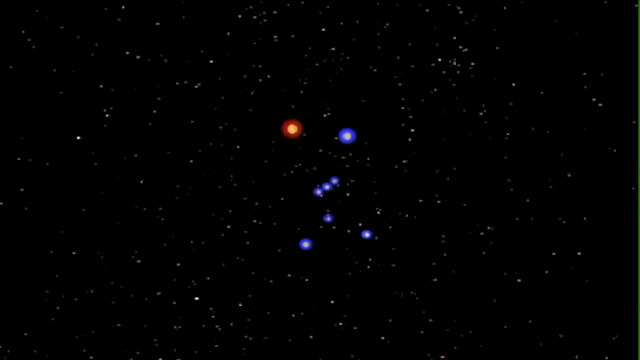 Star size can be selectively controlled to highlight stars of a particular type or the members of a single constellation. We can even use estimated mass, orbital period, radius and eccentricity data to show the planetary systems of those stars recently discovered to have planets orbiting them (extra-solar planets).